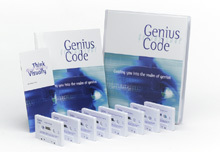 Crack your "Genius Code" and genius is automatic! Tune in to those secret messages that your brain automatically sends you to boost your IQ, solve any problem, accelerate learning, recognize golden opportunities, and supercharge your intuition. Now you can develop superior mental powers similar to those possessed by the greatest minds in humankind. Optional  You can also acquire the course on both audio tapes and compact discs direct from Learning Strategies Corp. (see below). Use our convenient and secure online ordering service. To order Genius Code, simply click on the appropriate ORDER button.